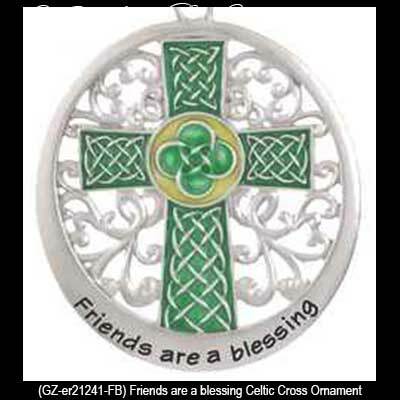 Friends are a blessing Celtic Cross Irish Christmas Tree Ornament with Celtic Knots. 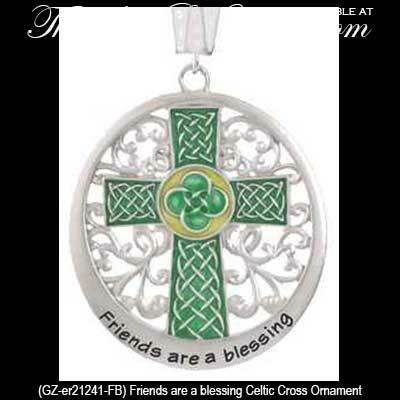 Sorry, this Celtic cross ornament is now sold out. High crosses are found throughout Ireland on old monastic sites. The earliest Celtic crosses were made from wood or metal but the great stone monuments seen today date from the 9th century. Metal Celtic Cross Irish Christmas Tree Ornament with Celtic Knots. Features enamel accents, a filigree design and the message Friends are a blessing. 2" Wide x 2 1/2” Tall. Ready to Hang with Included White Ribbon. Gift Boxed with the Celtic Knot History.